In this paper, we introduce a simulation-driven optimization approach for achieving the optimal design of electromagnetic wave (EMW) filters consisting of one-dimensional (1D) multilayer photonic crystal (PC) structures. The PC layers’ thicknesses and/or material types are considered as designable parameters. The optimal design problem is formulated as a minimax optimization problem that is entirely solved by making use of readily available software tools. The proposed approach allows for the consideration of problems of higher dimension than usually treated before. In addition, it can proceed starting from bad initial design points. The validity, flexibility, and efficiency of the proposed approach is demonstrated by applying it to obtain the optimal design of two practical examples. The first is (SiC/Ag/SiO2)N wide bandpass optical filter operating in the visible range. Contrarily, the second example is (Ag/SiO2)N EMW low pass spectral filter, working in the infrared range, which is used for enhancing the efficiency of thermophotovoltaic systems. The approach shows a good ability to converge to the optimal solution, for different design specifications, regardless of the starting design point. This ensures that the approach is robust and general enough to be applied for obtaining the optimal design of all 1D photonic crystals promising applications. J. D. Joannopoulos, S. G. Johnson, J. N. Winn, and R. D. Meade, Photonic Crystals: Molding the Flow of Light (Princeton University, 2011). D. W. Prather, Photonic Crystals, Theory, Applications and Fabrication, Vol. 68 (Wiley, 2009). A. Baldycheva, V. A. Tolmachev, T. S. Perova, Y. A. Zharova, E. V. Astrova, and K. Berwick, “Silicon photonic crystal filter with ultrawide passband characteristics,” Opt. Lett. 36, 1854–1856 (2011). Z. Jakšić, M. Maksimović, and M. Sarajlić, “Silver–silica transparent metal structures as bandpass filters for the ultraviolet range,” J. Opt. A 7, 51–55 (2005). Y. Ohtera, D. Kurniatan, and H. Yamada, “Design and fabrication of multichannel Si/SiO2 autocloned photonic crystal edge filters,” Appl. Opt. 50, C50–C54 (2011). X.-F. Xu and J.-Y. Ding, “A wide band-pass filter of broad angle incidence based on one-dimensional metallo-dielectric ternary photonic crystal,” Opt. Quantum Electron. 41, 1027–1032 (2009). J. He, P. Liu, Y. He, and Z. Hong, “Narrow bandpass tunable terahertz filter based on photonic crystal cavity,” Appl. Opt. 51, 776–779 (2012). H. Kurt and D. Citrin, “Photonic crystals for biochemical sensing in the terahertz region,” Appl. Phys. Lett. 87, 041108 (2005). D. Chubb, Fundamentals of Thermophotovoltaic Energy Conversion (Elsevier, 2007). 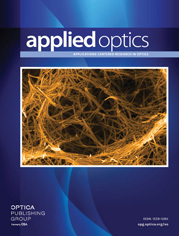 M. H. Asghar, M. Shoaib, F. Placido, and S. Naseem, “Modeling and preparation of practical optical filters,” Curr. Appl. Phys. 9, 1046–1053 (2009). W. Jia, J. Deng, B. P. Reid, X. Wang, C. Chan, H. Wu, X. Li, R. A. Taylor, and A. J. Danner, “Design and fabrication of optical filters with very large stopband (=500 nm) and small passband (1 nm) in silicon-on-insulator,” Photon. Nanostruct. Fundamentals Appl. 10, 447–451 (2012). J. Xu, “Optimization of construction of multiple one-dimensional photonic crystals to extend bandgap by genetic algorithm,” J. Lightwave Technol. 28, 1114–1120 (2010). I. Celanovic, F. O’Sullivan, M. Ilak, J. Kassakian, and D. Perreault, “Design and optimization of one-dimensional photonic crystals for thermophotovoltaic applications,” Opt. Lett. 29, 863–865 (2004). Y. Xuan, X. Chen, and Y. Han, “Design and analysis of solar thermophotovoltaic systems,” Renewable Energy 36, 374–387 (2011). J. Baedi, H. Arabshahi, M. G. Armaki, and E. Hosseini, “Optical design of multilayer filter by using PSO algorithm,” Res. J. Appl. Sci. Eng. Technol. 2, 56–59 (2010). H. A. Badaoui and M. Abri, “One-dimensional photonic crystal selective filters design using simulated annealing optimization technique,” Prog. Electromagn. Res. B 53, 107–125 (2013). M. A. Swillam, M. H. Bakr, and X. Li, “The design of multilayer optical coatings using convex optimization,” J. Lightwave Technol. 25, 1078–1085 (2007). N. H. Rafat, S. A. El-Naggar, and S. I. Mostafa, “Modeling of a wide band pass optical filter based on 1D ternary dielectric–metallic–dielectric photonic crystals,” J. Opt. 13, 085101 (2011). S. I. Mostafa, N. H. Rafat, and S. A. El-Naggar, “One-dimensional metallic-dielectric (Ag/SiO2) photonic crystals filter for thermophotovoltaic applications,” Renewable Energy 45, 245–250 (2012). S. Koziel and L. Leifsson, Surrogate-Based Modeling and Optimization (Springer, 2013). A.-K. S. Hassan, “Normed distances and their applications in optimal circuit design,” Optim. Eng. 4, 197–213 (2003). A.-K. Hassan, A. S. Mohamed, and A. Y. El-Sharabasy, “Statistical microwave circuit optimization via a non-derivative trust region approach and space mapping surrogates,” in Microwave Symposium Digest (MTT), IEEE MTT-S International (IEEE, 2011), pp. 1–4. A.-K. S. Hassan and A. Abdel-Naby, “A new hybrid method for optimal circuit design using semi-definite programming,” Engineering Optimization 44, 725–740 (2012). A. D. Waren, L. S. Lasdon, and D. F. Suchman, “Optimization in engineering design,” Proc. IEEE 55, 1885–1897 (1967). C. Charalambous and A. Conn, “An efficient method to solve the minimax problem directly,” SIAM Journal on Numerical Analysis 15, 162–187 (1978). J. W. Bandler, W. Kellermann, and K. Madsen, “A superlinearly convergent minimax algorithm for microwave circuit design,” IEEE Trans. Microwave Theory Tech. 33, 1519–1530 (1985). J. Hald and K. Madsen, “Combined LP and quasi-Newton methods for minimax optimization,” Mathematical Programming 20, 49–62 (1981). K. Chemmangat, F. Ferranti, T. Dhaene, and L. Knockaert, “Optimization of high-speed electromagnetic systems with accurate parametric macromodels generated using sequential sampling of the design space,” in International Conference on Electromagnetics in Advanced Applications (IEEE, 2012), pp. 128–131. J. Jen, M. Qian, Z. Aliyazicioglu, and H. Hwang, “Performance studies of antenna pattern design using the minimax algorithm,” in Proceedings of the 5th WSEAS International Conference on Circuits, Systems, Signal and Telecommunications (World Scientific and Engineering Academy and Society, 2011), pp. 50–55. J. Pendry, “Photonic band structures,” J. Mod. Opt. 41, 209–229 (1994). MATLAB, Version 7.10., The MathWorks, Inc., 3 Apple Hill Drive, Natick, MA 01760–2098, USA, 2010. G. Nehmetallah, R. Aylo, P. Powers, A. Sarangan, J. Gao, H. Li, A. Achari, and P. Banerjee, “Co-sputtered sic+Ag nanomixtures as visible wavelength negative index metamaterials,” Opt. Express 20, 7095–7100 (2012). S. Chen, Y. Wang, D. Yao, and Z. Song, “Absorption enhancement in 1D Ag/SiO2 metallic-dielectric photonic crystals,” Opt. Appl. 39, 473–479 (2009). X. Ni, Z. Liu, and A. V. Kildishev, “PhotonicsDB: Optical Constants,” 2010, http://nanohub.org/resources/PhotonicsDB/usage . Fig. 1. Basic structure of a 1D PC filter. Fig. 2. Flow diagram for the proposed optimization algorithm. Fig. 3. (a) Transmittance and (b) absorbance of ( SiC / Ag / SiO 2 ) 5 , before and after optimization, starting from an initial point: d 1 = 20 nm , d 2 = 10 nm , and d 3 = 70 nm . The case of PSCT is considered. Fig. 4. (a) Transmittance and (b) absorbance of ( SiC / Ag / SiO 2 ) 5 before and after the optimization. Solution A is assigned to the initial design point. The case of PLSVT is considered. Fig. 5. (a) Transmittance and (b) absorbance of ( SiC / Ag / SiO 2 ) 5 before and after optimizing. Starting from initial point: d 1 = 3 nm , d 2 = 3 nm and d 3 = 3 nm . The case of PLSVT is considered. Fig. 6. (a) Transmittance and (b) absorbance of ( SiC / Ag / SiO 2 ) 5 , before and after optimizing starting from initial point: d 1 = 70 nm , d 2 = 10 nm , and d 3 = 70 nm . The case of PLSVT is considered. Fig. 7. (a) Transmittance and (b) absorbance of ( SiC / Ag / SiO 2 ) 5 before and after optimizing. Solution B is assigned to the initial design point. The case of PLSVT is considered, and the ripples constraint is taken into consideration. Fig. 8. (a) Transmittance and (b) absorbance of the SiO 2 ( Ag / SiO 2 ) 3 spectral filter, before and after optimizing for the highest passband transmittance. The initial point is assumed as the QWTD for SiO 2 -layers, while the Ag layers are fixed to 10 nm. The obtained optimal solution is referred to as solution 1. Fig. 9. (a) Transmittance and (b) absorbance of the SiO 2 ( Ag / SiO 2 ) 3 spectral filter, before and after optimizing for the least stopband transmittance. The initial point is assumed as the QWTD for SiO 2 layers, while the Ag layers are fixed to 10 nm. The obtained optimal solution is referred to as solution 2. Fig. 10. (a) Transmittance and (b) absorbance of the D ( Ag / D ) 3 spectral filter, before and after optimizing for the least possible stopband transmittance, where D refers to a dielectric layer. Solution 2 is considered as an initial point. Both the refractive index of the dielectric layers and the thickness of layers are optimized.